A few days ago, I was having lunch with a guy who’s mentored me over the past year or so and something came up in conversation that struck a cord with me. It wasn’t a quote, or even a topic of conversation, but an idea. A fraction of a sentence. The thought floated out there and gripped and convicted me. He mentioned, just in passing, the idea that some churches hold their members to a certain standard, and others have no expectations on them. I started to wonder, does my church, does my ministry, does my community hold me to certain expectations, or are they content with me claiming the name of Christ alone? Hear me say this, I’m not negating the gospel or the total depravity of people. There’s no “standard” we could attain. 12 Put on then, as God’s chosen ones, holy and beloved,compassionate hearts, kindness, humility, meekness, and patience, 13 bearing with one another and, if one has a complaint against another, forgiving each other; as the Lord has forgiven you, so you also must forgive. 14 And above all these put on love, which binds everything together in perfect harmony. 15 And let the peace of Christ rule in your hearts, to which indeed you were called in one body. And be thankful. 16 Let the word of Christ dwell in you richly, teaching and admonishing one another in all wisdom, singing psalms and hymns and spiritual songs, with thankfulness in your hearts to God. 17 And whatever you do, in word or deed, do everything in the name of the Lord Jesus, giving thanks to God the Father through him. I think too often, Christians take Colossians 3:14 and twist it into a perverted version of tolerance where we tell each other, “I’m a believer, you’re a believer, but who are you to call out how I live my life? If I want to embrace a certain path/decision/lifestyle/behavior, God loves me no matter what! He loves me and he’s okay with it, so you should be too!” Hopefully, you notice the breakdown in logic. We assume that because God loves us (and he does), that he is content in leaving us where we are. So all of that to say, would you say that your church or your community of believers is content to let you stay there? The sin in me wants a community who won’t call me out, have the hard conversations, and hold me accountable in my life. But I know for me to continue to be made into the image of Christ, I need those people who will spur me on and challenge me in my faith. May we never lead churches that are content to leave people in their filth. May our churches be those that embrace people no matter where they are, but disciple them and walk with them as they too walk through life with Christ, allowing him to remove the poop. If you would say your church or community would fit more on the side of the “Let you have fun in your poop” spectrum, my encouragement is not to go find new community or a new church. Instead, what can you do to be used by God as a change agent in your community. Are you part of the problem? Second to last week in our One Month to Live series, and we talked about having an eternal focus! Often in our culture, we’re told to be a doctor for the money, big house, nice cars, and social status. We want to have the North Faces and the nice jeans so people know we’re important! At ECHO, we asked the big question of, “Can we be a doctor, can we have a North Face, can we do any of that and still follow Christ?” The conclusion? Of course. It’s about your priorities and your perspective. We have to shift our focus from the internal to the eternal. Here are the three things we discussed, a key thought, and some passages we used to go along with it! Materialism defined as a preoccupation with or emphasis on material objects, comforts, and considerations, with a disinterest in or rejection of spiritual, intellectual, or cultural values. A shift in priorities, reversing materialism. You can’t both EMBRACE materialism and RELEASE your grasp on the stuff of your life. It’s about how we set our priorities. You can focus on “churchy” stuff, and still be wrong. Final thought: Our life isn’t about what we have, but about Who has us. Yesterday at Fellowship Cabot, we saw Mark Henry preach on Philippians, and he said something that really hit home for me. He said, “If you were to go off to Oklahoma City or somewhere for a month, what kingdom work would go undone?” I’m paraphrasing the quote, but that’s the general idea of it. I think that’s an excellent “gut check” for any believer. Are you serving? Are you giving of yourself? 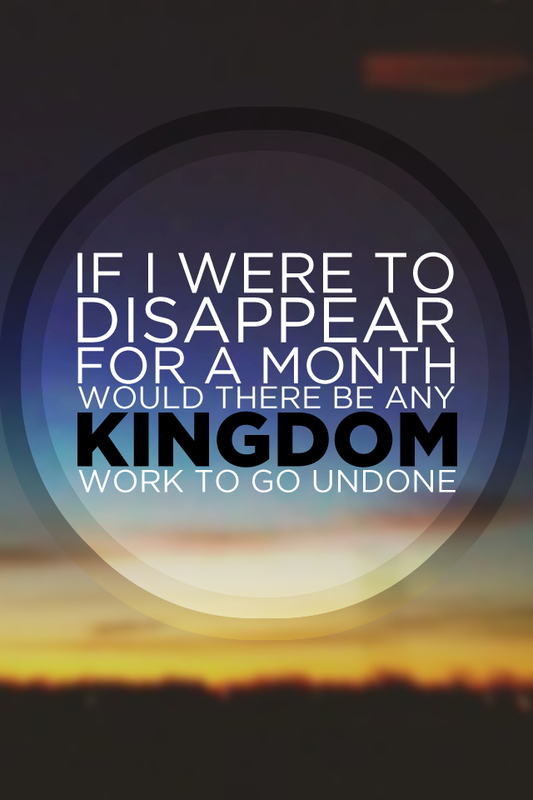 Are you so involved in serving that if you were to disappear, there would be a noticable void? I decided to do a quick iPhone background for myself, so I can have a constant reminder. I’m not the graphic designer. That’s my wife. She’s AMAZING at design!! (Hint, hint. If you need freelance design or branding, that’s her bread and butter). BUT, it’s good enough to be a daily reminder to serve, and I thought I’d share for anyone that wants it! Click the image to open it in a new window. Hold down on the image. Click the box with an arrow going out.